The Ryson Mass Flow Spirals are designed to handle full and empty bottles, cans, jars and other similar containers. 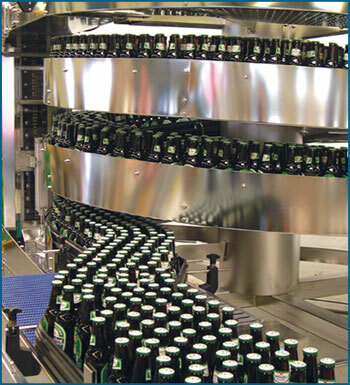 The Ryson Mass Flow Spirals are ideal for canning and bottling operations where units need to be conveyed vertically in mass. Products are conveyed up or down in a continuous single file or mass flow at a rate of 2000 units per minute. 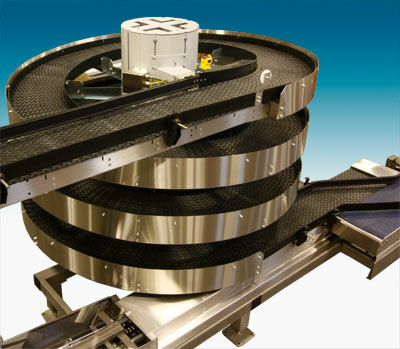 Ryson Spirals have a small footprint and provide considerable space savings compared to conventional methods. They are available in powdered coated carbon steel, stainless steel and washdown versions. Click to see examples of Mass Flow applications on our weekly blog. 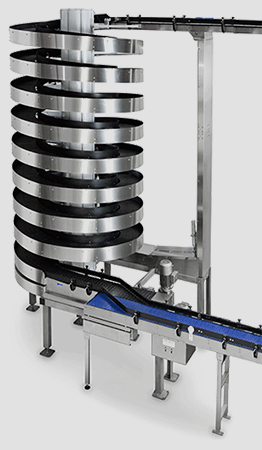 The Mass Flow Spiral conveyors are based on the already proven and reliable Ryson Spiral technology. Only one drive motor is needed, equating to substantial savings in controls and systems integration. All Ryson Spirals are designed for low maintenance and long life. Many spirals operate 24 hours a day, 7 days a week. The Ryson Mass Flow Spirals feature nesting slats with a flat conveying surface and no gaps. 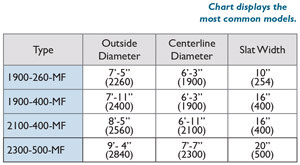 They can be delivered with 10”, 12”, 16” or 20” wide slats depending on the needed flow rates. The Mass Flow Spirals are equipped with extended in and outfeed tangents to facilitate smooth and reliable side transfer to and from external conveyors. For more details on the Ryson Mass Flow Vertical Conveyors, please visit our Ryson YouTube Channel, or read current news and installation stories about the Mass Flow Spirals on the Ryson Blog. Application Example: Mass Flow Spiral coming off a bulk de-palletizer. 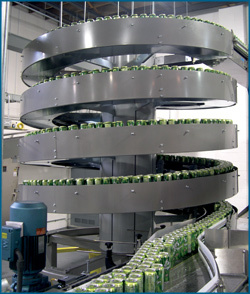 High Capacity Mass Flow Spirals (Models 1900-400 & 2400-500) are able to provide space-savings in bulk de-palletizing of bottles, cans and jars. 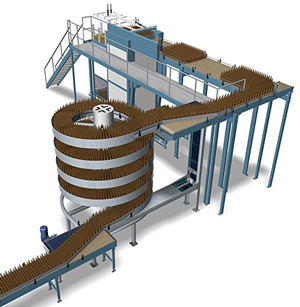 Use of the Ryson Mass Flow spiral conveyor in conjunction with either high or low-level bulk de-palletizers provides yet another way to increase productivity. 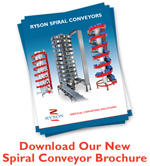 Download the information on the Ryson Spiral Conveyor here. Haga clic aquí para descargar información acerca de este producto en PDF.